Enabling LEDs to follow the black-body radiation curve isnt black magic, and Uwe Thomas explains a successful approach to the challenge of dimming SSL products to warm CCTs. People are comfortable with the familiar, uncomfortable with the unexpected. When a halogen or incandescent lamp is dimmed, less current passes through the lamp filament. The filament cools down, producing a warmer light with a greater proportion of radiation at the red end of the spectrum. As a result, we are conditioned to expect that dimming a lamp will produce a warm, relaxing ambience. LEDs produce light through a different physical mechanism — electroluminescence rather than incandescence. Here there is no significant color temperature shift when the current that passes through an LED die is reduced in order to lower its lumen output. You must design LEDs and solid-state lighting (SSL) systems to dim like halogen lamps. Directional halogen lamps are popular in hospitality environments. But in these applications, the well-documented benefits of LED lighting over halogen lamps are desirable. In particular, LED lights sources are far more efficient at converting electricity into light, so they save energy and run cooler. However, making an LED source dim with a similar color shift to a halogen source, maintaining color quality along the way, has presented significant technical challenges to designers of LED emitters and fixtures. The aim has been to find an LED emitter that closely follows the idealized black-body curve as it dims. Better still would be one that follows the curve even more closely than halogen sources. To understand how this is achieved, it is important to consider the specific requirements for LED die, substrates, optics, and control electronics that make the halogen-style dimmable, directional LED fixture technically possible and commercially viable. First lets examine in more detail how a legacy source works. We all know that when we heat a piece of metal it glows. The glow is thermal radiation, a type of electromagnetic radiation, caused by the thermal motion of charged particles in the metal. The color of the glow moves from red through orange, yellow, white, and eventually to blue. While the brightness of the glow will vary with the material in question, the spectral distribution will not; it depends only on temperature. A black body refers to an idealized body that absorbs all of the electromagnetic radiation that strikes it; it doesnt transmit or reflect energy. When a black body is heated, the frequency, or color temperature, of radiation it emits can be plotted in accordance with an accepted formula — Plancks law of black-body radiation . Halogen lamps function by passing an electrical current through a tungsten filament suspended in a glass envelope. A small amount of iodine or bromine (the halogen) is contained within the envelope and this ensures that evaporated tungsten is deposited back onto the filament, rather than on the inside of the glass envelope. The light emitted from the tungsten filament follows the idealized black-body curve quite closely but does deviate somewhat from the ideal black-body curve, producing a greenish tinge at some temperatures. 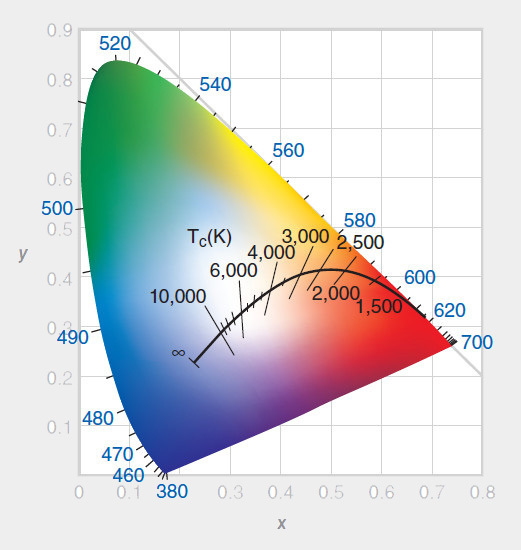 Color quality, defined in terms of color rendering index (CRI), is well maintained by halogen lamps as they dim. The light from an LED is not created by thermal radiation. LEDs create light through electroluminescence. Light is emitted when electrons and holes recombine in a material, most commonly a semiconductor. The spectrum, or color, of light emitted is determined primarily by the constituent materials of the semiconductor and by phosphors — chemicals used to coat the LED die. As a result, when an LED dims as less current is passed through it, the color temperature shift is very small because thermal radiation represents a negligible portion of the total light emitted. In fact, the hue change as an LED dims is hardly discernible to the human eye. Were accustomed to halogen-like dimming, and to the high CRI of halogens being maintained as they dim. CRI is most noticeable in skin tones. With consistent CRI, skin tones remain natural as the light level is reduced. The human eye is incredibly sensitive to color change, much more so than to small changes in brightness. During the day, were most sensitive to blue light and its from this that we get a great deal of our sensitivity to color shift. We identify detail through the green and red regions of the spectrum and perceive luminance changes primarily within the green part. Incidentally, pure white is, by definition, 76% green, 22% red, and 12% blue light. Were used to halogen dimming; we feel familiar and comfortable with the effect and if a light dims without appearing to create a warmer white, it feels unnatural — something thats very undesirable in a hospitality environment such as a restaurant, bar, or hotel. If we are going the change the color of an LED light source along the black-body curve or other profile as it dims, we must mix the light from at least three types of die to produce a range of white tones, or color temperatures. To make a white LED emitter, you coat a blue LED die with a combination of red and yellow phosphors. Most commonly, die that produce light at 445–455-nm wavelength are used, but those that produce longer wavelengths may be adopted. The combination of die wavelength and yellow/red phosphor recipe is used to achieve the desired color points. Phosphors may be sprayed onto the LED wafer before its sliced up to create the individual die, or printed directly onto the die. The latter method creates a direct thermal path for the phosphor layer, helps the phosphor run cooler, and produces more consistent phosphor characteristics. In such instances, the light from the die may be matched to within 3 MacAdam ellipses. Combining multiple different die/phosphor configurations can produce color temperatures ranging from 1800K to 5500K when mixed within a single high-density package. In order for light to be mixed effectively, the LED die must be closely packed on the substrate. Passing current through the LED creates heat, which has implications for stability over its operating life, but limiting the current reduces the lumen output. This tradeoff can be tackled in two ways. Rather than using an adhesive to attach the die to the substrate, which creates a significant thermal barrier that limits effective dissipation of heat from the LED die, it is better to adopt a proprietary technology that uses a gold eutectic die-attach process with much better thermal conductivity. If a multilayer ceramic substrate with a coefficient of thermal expansion (CTE) closely matched to that of the LED die is employed, it will minimize stress as the die heats up. This combination of technologies enables die to be driven at higher currents, producing more light from smaller packages, without reaching damaging junction temperatures. Where a glass primary lens is used on top of the die it will not degrade over time as a silicone lens would, so color stability is maintained throughout the operating life of the emitter. Color mixing starts close to the die and can be completed using carefully matched secondary optics that also enable tight focusing of the beam through a total internal reflection (TIR) design (Fig. 2). A consistent quality of light is then achieved across the beam. It has been demonstrated that compact emitters used with matched secondary optics can deliver twice the lumens-on-target compared with conventional emitter/reflector combinations (Fig. 3). Furthermore, the compact emitter/lens combination produces a smooth beam edge and minimizes light emitted outside of the target area, reducing unwanted glare. This is an important requirement in hospitality and other professional lighting applications. The emitter and emitter/lens technologies described previously can be combined to underpin a tunable white LED platform. For example, LuxiTune developed by LED Engin is available as an emitter plus secondary TIR optic and integrated driver . The module reduces the time taken by lighting fixture manufacturers to bring new products to market. In this instance, the single emitter consists of 12 die driven via 3 channels, i.e., 3 groups of 4 die. 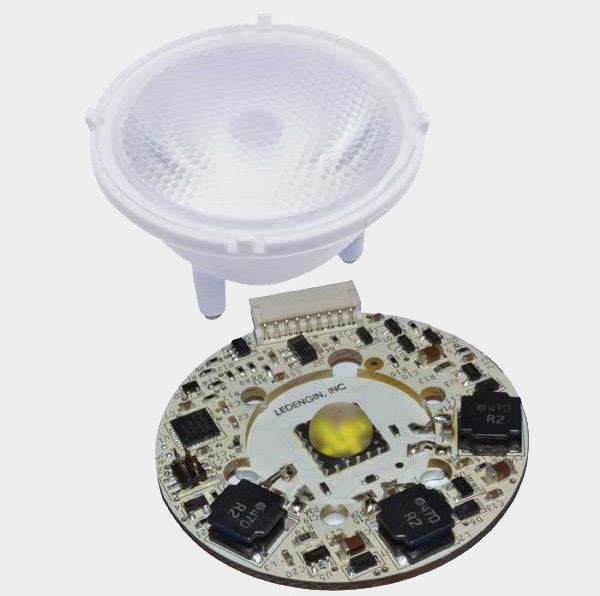 The substrate design actually enables each LED die to be driven independently. The secondary optics create beam widths of 24°, 32°, or 45°, with minimal wasted light or glare. The printed circuit board upon which the emitter is mounted to complete the module carries the control electronics that determine the relative drive to each group of die. By triangulating the light from each group, the color temperature is varied from 3000K at the highest lumen output to 1800K fully dimmed to below 2% of maximum output . The control board incorporates an interface circuit to industry-standard, widely available, and low cost 0–10V dimmers or push-button controls. DMX interfaces are optional. This platform runs from a single, unregulated 24V power rail. AC-DC power supplies that deliver this voltage are readily available at low cost. Control is achieved using proprietary algorithms running on a microcontroller. The programming ensures consistent color temperature and flux throughout the operating temperature range and no recalibration is ever required. The processes and technologies described earlier ensure that emitters are of consistent color temperature to within 3 SDCM (Standard Deviation Color Matching) or MacAdam ellipses, so fixtures throughout an installation will deliver the same performance. At 3000K, a CRI of 90 and R9 of 80 can be achieved and across the dimming range the CRI average is 85; the red component, R9, averages 70. Typical output is 1100 lm and at stable temperature from the TIR lens. Power consumption is 17.3W for a luminous efficacy of 63 lm/W. At maximum output, such emitters are approximately equivalent to 60W halogen sources but with up to 70% energy savings. A further benefit is that they run much cooler than halogens, eliminating the safety hazards that high-temperature fixtures can pose. Proprietary technologies for selecting and coating LED die, attaching the die to the substrate, substrate design, primary and secondary optics design, and control electronics have now been combined to create easy-to-implement solutions for producing halogen-like dimming from compact, efficient, and economical LED sources.